Deemed as “summer in a bottle!”, this fast-absorbing body milk is said to leave your skin feeling hydrated and mositurised. Presented in a sleek tube, it’s packed with antioxidants that will also provide longer lasting protection for your skin. I’ll give it a thumbs for ‘fast absorbing’ as I’m usually put off by body milks due to the fact that they spill everywhere and leave a greasy film, not only over my skin, but my carpet too. But this one absorbed quickly and left my skin feeling really smooth. The smell however, doesn’t remind me of summer, but of those plastic air fresheners you usually hide above the bathroom cabinet. But each nostril to its own I suppose. Retailed at £16.55 a bottle, you’ve really got to love this scent…or your skin smelling like a fresh loo. Part of a four piece collection of nail polishes, retailed at £15.00, these pretty pastels are inspired by the retro styles of the 70’s and 80’s and are exclusive to Birchbox. What was great about this product, was that Birchbox invited us to choose our polish colour this month, so I opted for Heirloom Pearls as I think this will look cool and bright on my toes by the pool this summer. In all honesty I haven’t yet used this product as I’ve had a shellac pedicure and manicure since receiving it, but I will most definitely try it out soon. A silky smooth eye pencil that is said to be the must have accessory for creating the perfect smoky eye look. The liner can be used to create a solid black line or is easily smudged for a softer finish. Oh my Lord. This eye liner is fan-blimming-tastic. It glides across the eyes effortlessly, creating a clear and smooth line and it is long lasting. I am forever changing my eye liner and I’ve used cheap and top end brands in search of the perfect pencil and I think I might have found it. Retailed at £10.00 (obviously for a full length pencil rather than the miniature sample shown above) I think this pencil is well worth the splurge. 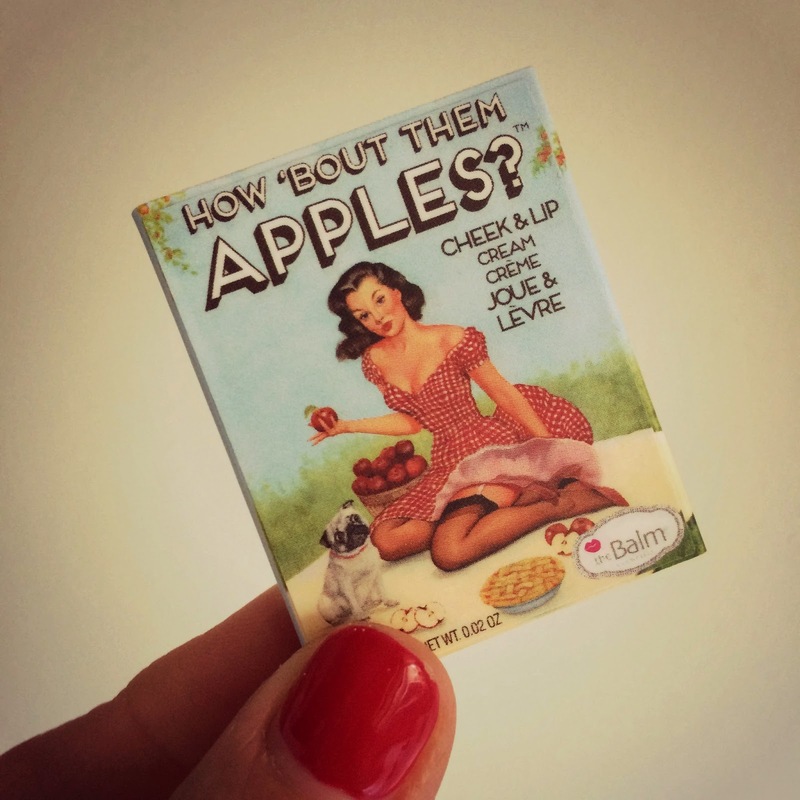 TheBalm Cosmetics…How ‘Bout Them Apples? 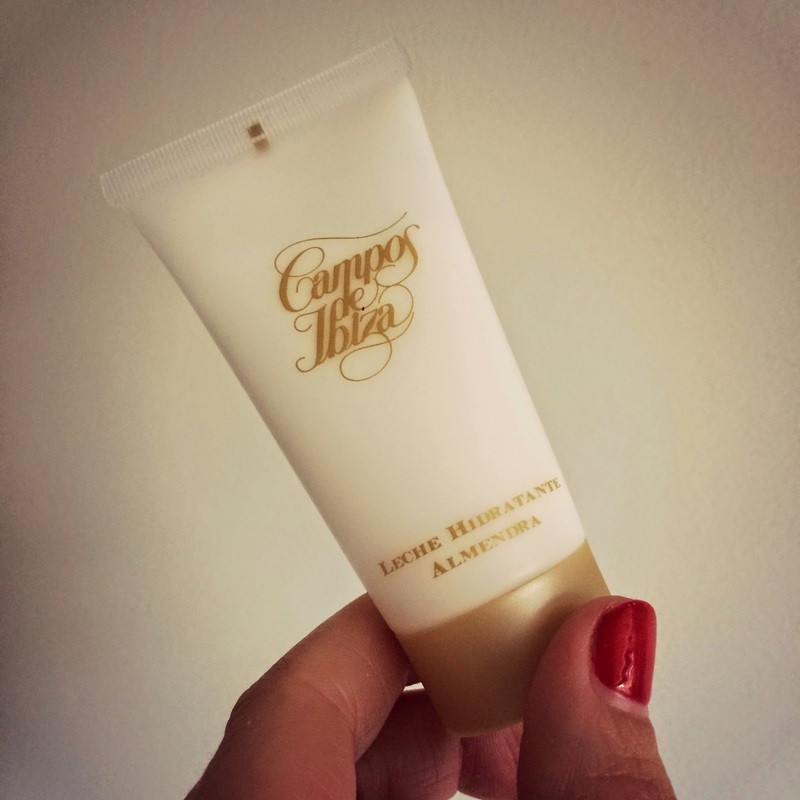 Gorgeous and quirky, this cheek and lip balm creme is perfect for brightening up your face. It’s creamy formula means that the product is long wearing and promises not to smudge or face once applied. Simply dab onto your cheeks and lips using your fingertips and blend. This product is super cute, long lasting and really easy to use. I was sent the creme colour ‘Pie’ which is a really lovely shade of pink. Retailed at £26.00 for a collection of six shades, this product is a pricey little splurge, but would make a fabulous birthday gift. Did you know cucumber is a fruit? Surely I’m not the only one…am I? 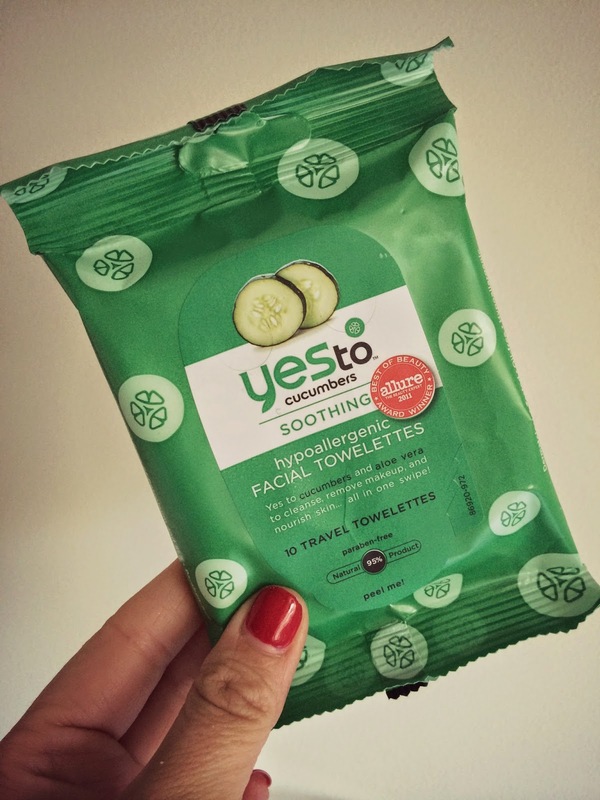 Anyhoo, Yes To (a fab new brand I hadn’t heard of before) have sourced a more beneficial way of using the ‘cooling fruit’ (who knew…) and have created their face wipes using the rejuvenating vitamins from organic cucumbers to help soothe your skin. They are also packed with anti-inflammatory green tea extracts and aloe vera so are literally bursting with goodness for your skin. Fresh as a…cucumber. These face wipes are unbelievably refreshing and were a godsend when my eye was lovely and infected last week. They really are immediately soothing and one wipe removed all my make up brilliantly. They did leave a tingling sensation after using, but I’m guessing that will be all the nutrients going to work after use, rather than my face having another dodgy reaction. They smell exactly like The Body Shop’s Cucumber Water which I used when I was about fifteen, fighting an endless battle with my teenage skin irritations. Using cucumber water was about the only thing that didn’t leave my face feeling as though I’d just had a skin peel. Amazing stuff. Retailed at £4.99 for 30 wipes, this product would be the perfect holiday toiletry treat for your skin after a long day in the sun. 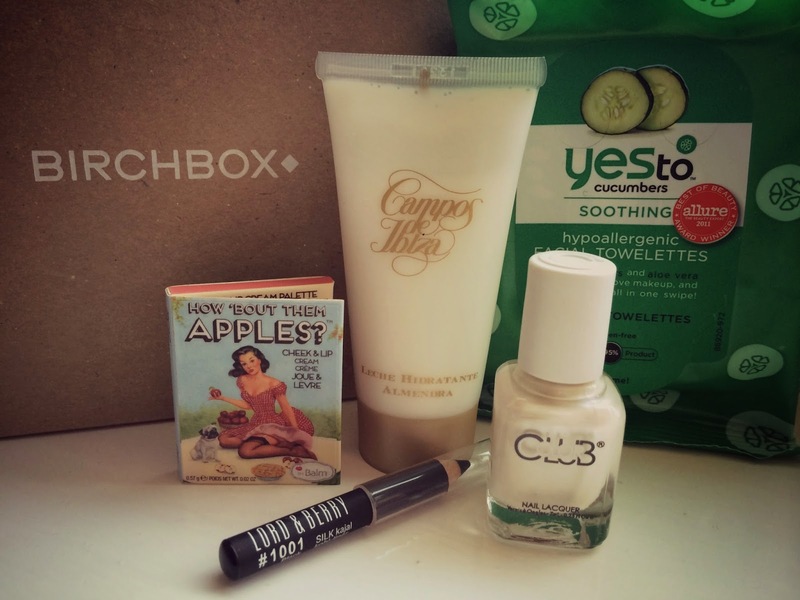 A very yummy and useful collection of products from Birchbox. 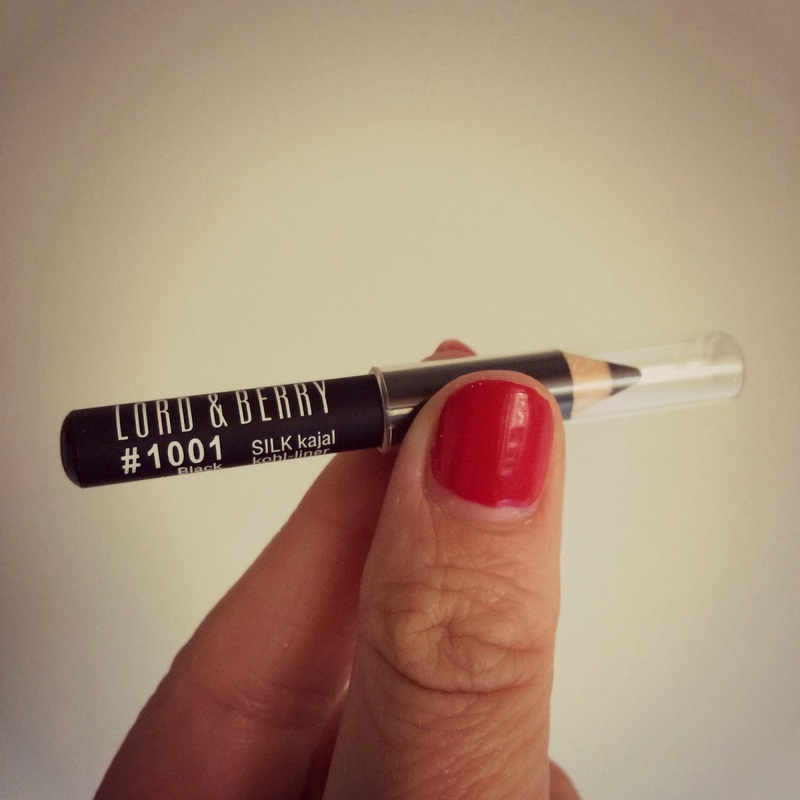 My absolute favourite item from this month’s box of goodies has to be the Lord & Berry Eye Pencil. Cool, sleek and solid, this pencil feels like it will retain its effectiveness even when its taken a squishing in the bottom of your make up bag. Bonus. Have you tried and tested any of this month’s products?